Summary: Read some of the notable charities Pak-Rite has been involved in this year. Great Cycle Challenge is a national Children's Medical Research Institute (CMRI) fundraising initiative held throughout the month of October. Their vision is a world without cancer where all kids are living life, and not fighting for it. The Great Cycle Challenge started in 2013, and after just 4 years, the event has grown to become one of the biggest cycling events in Australia. People of all ages, abilities, and from every state across the country set themselves a personal riding goal and challenge themselves to pedal throughout October to fight kids' cancer. In 4 years, the Great Cycle Challenge community of 31,359 riders from all states and 2 territories have ridden a total of 7,571,481 km and have raised a total of $8,969,212 in support of research to develop better treatments and find a cure for childhood cancer. Support the cause by clicking here. The vision of Flinders Foundation is to be Australia's leading foundation as they inspire medical discoveries and advancing global health. For many years, the Flinders Medical Centre Foundation has worked towards its motto of Prevent, Cure, Care, as the official Charity of the Flinders Medical Centre. The Foundation works to support a team of more than 3,500 medical staff and 400 medical researchers across the Southern Adelaide Local Health Network (SALHN) which includes Flinders Medical Centre, and Flinders University. To date, the Flinders Foundation has donated more than $65 million towards research, facilities and patient care initiatives at Flinders with the help of the SA community. Their mission is to provide excellence in aeromedical and primary health care across Australia. Using the latest in aviation, medical and communications technology, the Royal Flying Doctor Service works to provide emergency medical and primary health care services to anyone who lives, works or travels in rural and remote Australia. 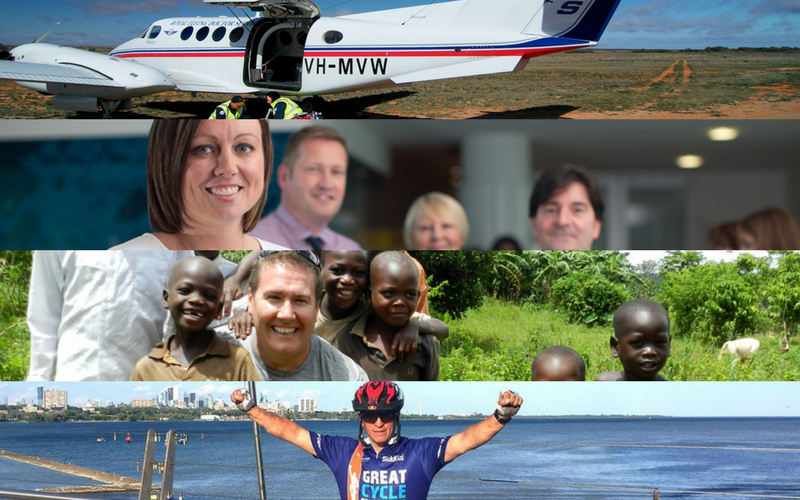 As a not-for-profit aeromedical organisation, Royal Flying Doctor Service rely on your help and generosity to keep the Flying Doctor flying. Angel Flight is a charity which coordinates non-emergency flights to assist country people to access specialist medical treatment that would otherwise be unavailable to them because of vast distance and high travel costs. All flights are free and may involve travel to medical facilities anywhere in Australia. The ESG Foundation is driven by purpose not just profit. The ESG Foundation helps those around the world who are less fortunate. They financially support projects or individuals to create educational opportunities to develop future leaders, so that they can inspire their own communities and improve the standards of living for future generations. The ESG Foundation seeks out projects and individuals that will benefit from being assisted in developing leaders and building their skill sets so that they are able to stimulate sustainable growth within their own communities. They are not looking to provide a quick fix, they want to help build the structures that will assist both current and future generations. Currently, the ESG Foundation is partnered with a number of organisations across Africa, and organises fundraising events throughout the year with all proceeds going toward developing leaders globally. Locally, the ESG Foundation works with Project Youth, a not-for-profit community organisation that has been running in the Sutherland Shire for over 20 years. They provide opportunities for local young people that allow them to determine their own futures. If you'd like to take part in making the world a better place, you can do so by clicking on the links provided above. For more questions about Pak-Rite's other initiatives, you can email us for details.